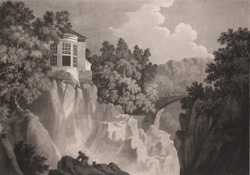 View of a small folly built overlooking a waterfall on the River Braan in Scotland. The folly was built by the second Duke of Atholl in the 18th century as part of the landscaping of his grounds. Scots landowners at this time were very experimental and it was fashionable to highlighting dramatic natural features of the land such as waterfalls with small viewing platforms or shelters. The folly is sometimes known as ‘Ossain’s Hall’ after a portrait of the 3rd century bard Ossain was hung on the wall. Author James Macpherson rediscovered the Ossain's and published a work translating them, making the bards poems very popular. When the folly was built a large portrait of Ossain was hung inside.